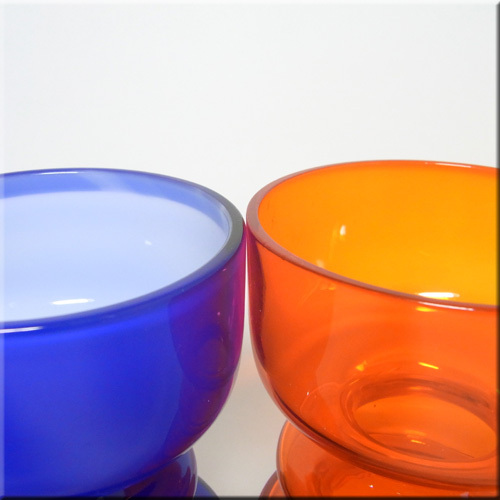 Lindshammar glass was founded in 1905 in the town of Lindshammar, Sweden, by Robert Rentsch, a German glass blower. In 1916 the company was bought by C.J. Petersson, with his son Anton Peterson as manager. After Anton's death in 1949, his son Erik Hovhammar took the reigns. 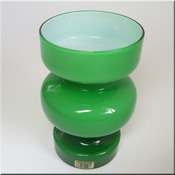 It was at this time that Gunnar Ander, Lindhammar's first designer, was employed, and began designing art glass. 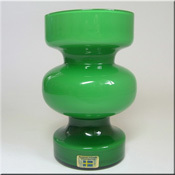 Gunnar Ander worked for Lindshammar until 1976. Lindshammar changed hands again in 1985, bought and managed by Ulf Rosén until 1998 when it was bought by CG Holding. 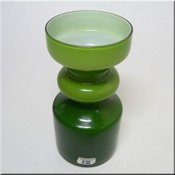 Lindshammar Swedish purple glass vase with internal white casing, designed by Gunnar Ander. 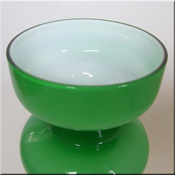 Ref: Scandinavian Glass - Fire & Sea p20-21. Lindshammar Swedish turquoise glass vase with internal white casing, designed by Gunnar Ander. Lindshammar Swedish blue glass vase with internal white casing, designed by Gunnar Ander. 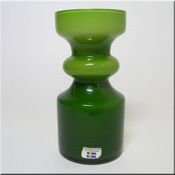 Lindshammar Swedish yellow glass vase, designed by Gunnar Ander. Lindshammar Swedish blue glass vase, designed by Gunnar Ander, labelled. 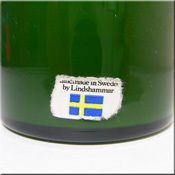 Lindshammar Swedish orange 'hooped' glass vase, labelled. Lindshammar Swedish 'hooped' glass vases. Lindshammar Swedish 'hooped' glass vases. 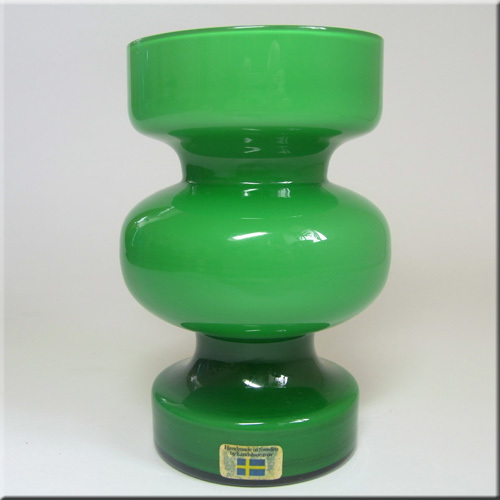 Lindshammar Swedish 'hooped' blue glass vase with internal white casing, imported to the UK by JC (Jones + Co). 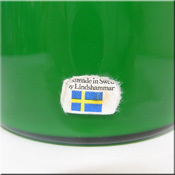 Lindshammar Swedish green 'hooped' glass vase with internal white casing, labelled. 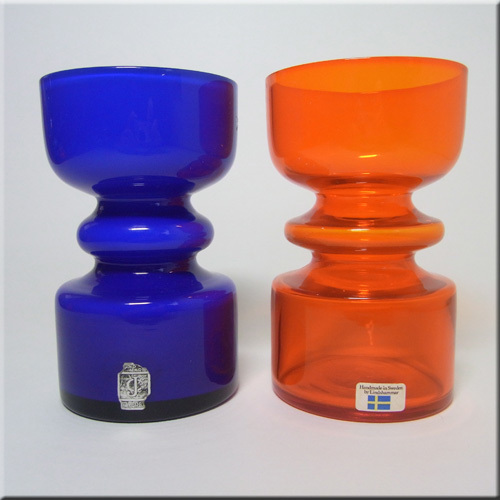 Lindshammar Swedish 'hooped' blue glass vase with internal white casing, imported to the UK by JC (Jones + Co). 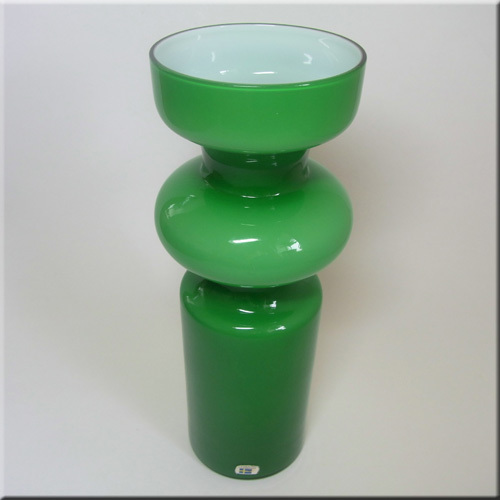 Lindshammar Swedish 'hooped' white cased glass vase. Ref: click here Lindshammar Swedish 'hooped' blue glass vase with internal white casing. 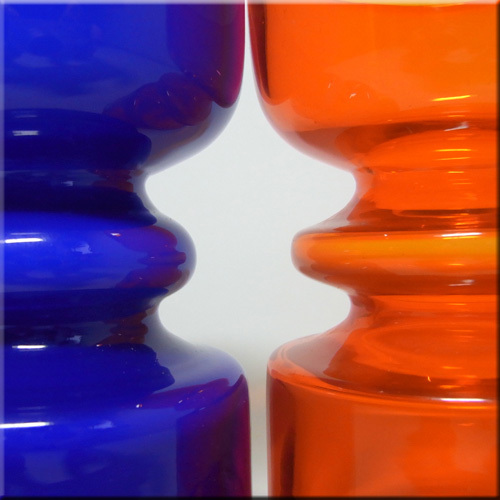 Blue 'hooped' glass vase with internal white casing, probably by Lindshammar, unmarked. Lindshammar Swedish 'hooped' blue glass vase with internal white casing. 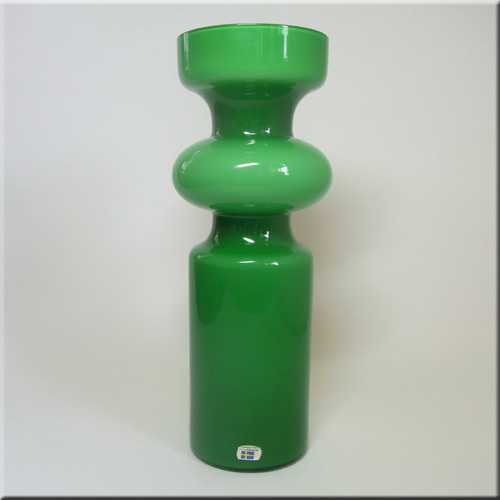 Lindshammar Swedish 'hooped' green glass vase with internal white casing. Ref: click here Lindshammar Swedish 'hooped' green glass vase with internal white casing. 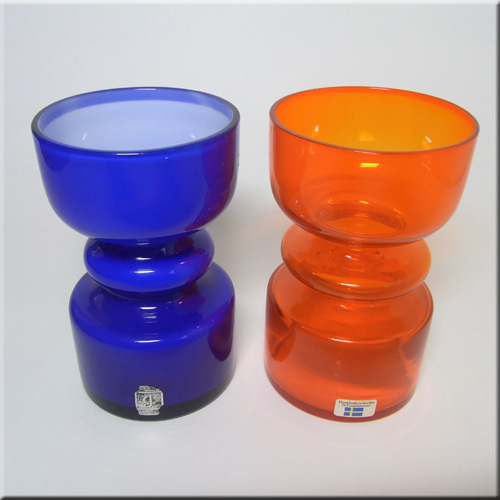 Ref: click here Lindshammar Swedish 'hooped' orange glass vase with internal white casing. Ref: click here Lindshammar Swedish 'hooped' turquoise glass vase with internal white casing. 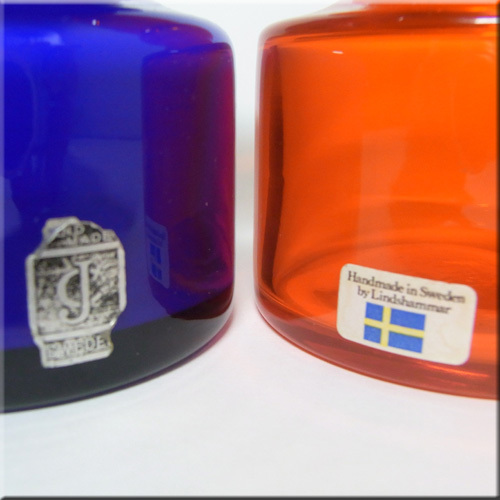 Lindshammar Swedish clear glass vase with blue swirls, designed by Gunnar Ander, labelled. Lindshammar Swedish clear glass horse paperweight, labelled. 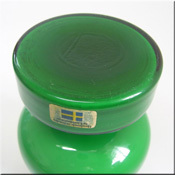 Lindshammar Swedish clear glass viking ship paperweight, labelled. 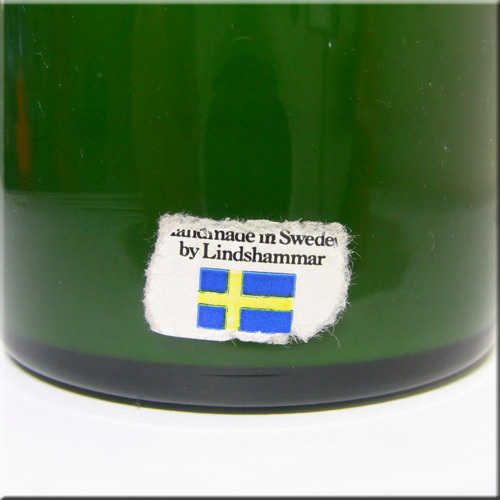 Lindshammar Swedish clear glass ship paperweight, labelled. Lindshammar Swedish amber + blue speckled glass vase, labelled. 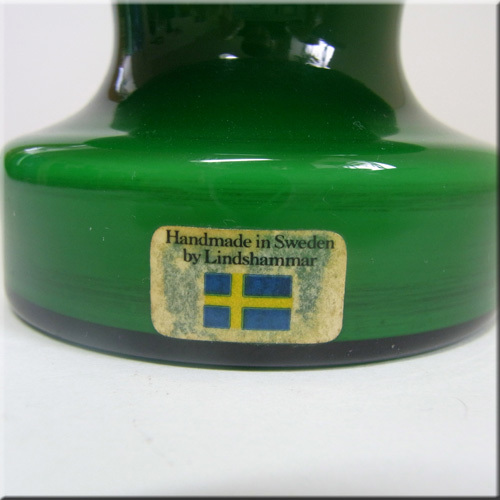 Lindshammar Swedish blue glass vase, designed by Gunnar Ander, labelled. Imported to the UK by JC (Jones & Co).